Journalist Vikki Tobak published her new book Contact High: A Visual History of Hip Hop on Oct. 16. The book is a collection of over 100 photos along with interviews and essays written by musicians and famous photographers that covers close to forty years of hip hop artists. The book contains a famous photograph taken in Sept. 28, 1998 by Gordon Parks, the first black photojournalist who worked at Life Magazine. The photo depicts a large gathering of hip hop artists in front of a Harlem brownstone building. The photo appeared on the cover of the December 1998 issue of XXL Magazine. However, this photo taken on East 126th was paying tribute to a similar photo taken on the same block 40 years earlier in 1958 by photographer Art Kane, a fashion and music photographer in the 50s. It was called A Great Day in Harlem and it featured dozens of jazz artists in a group shot. “When I was researching for this book, I thought about what photos would be iconic and this photo itself was a no-brainer,” said Tobak. 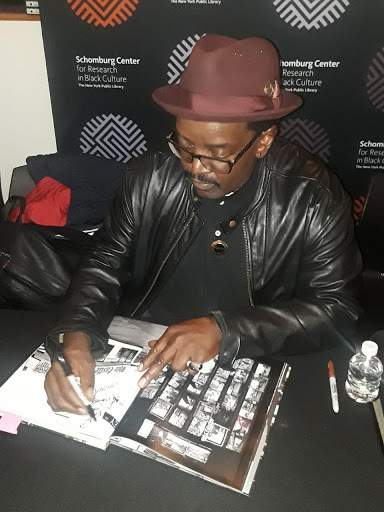 To celebrate the twentieth anniversary of the 1998 photo and the release of Contact High the Schomburg Center for Research in Black Culture in Harlem in partnership with Vikki Tobak hosted, A Great Day in Hip Hop: A Visual History 20 Years Later in New York, on Nov. 7. The Langston Hughes Auditorium was filled with hip hop fans as well as those who work in the rap music industry. The audience was first treated to clips shown by Journalist and Filmmaker Nelson George on his documentary in progress called, Great Day in Hip Hop. The audience saw interviews with the rapper Mos Def, Questlove, Slick Rick and others as they were assembling for the shoot that day. These clips can be seen currently on YouTube. Editor of BlackAmericaWeb.com Sheena Lester, Journalist Michael Gonzales, Rappers Fab 5 Freddy and Styles P. were the panelists of the event while the Editor in Chief of Vibe Magazine Datwon Thomas served as the moderator. The discussion opened with how the project came about. Lester, a former Editor In Chief at XXL Magazine, talked about working before at Rap Pages Magazine and the type of covers they put out. When she went to XXL, Lester thought about having a large group of artists on a cover. Lester said that the biggest challenge was trying to get Gordon Parks to be the photographer. Lester spoke of how she and the late publicist Lesley Pitts were turned down three times by Parks. Lester finally convinced Parks to say yes when she told him that he was the only photographer the editors felt could and should take the photo. Thomas spoke of being an intern for the magazine working that day waiting for the rappers to arrive. The audience learned from Thomas that the original jazz photo was taken at 17 East 126th Street, but the hip hop photo was taken two doors down in front of an abandoned brownstone. 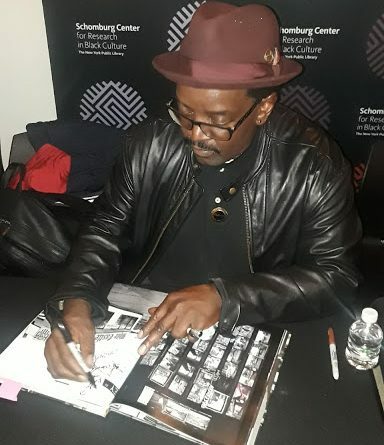 Fab 5 Freddy talked of being excited by the project since he was a fan of Parks and loved the original Kane photo. Gonzales talked of being on the block that day taking notes and talking to various people. As the discussion was taking place, many photos of the event appeared behind them on a large screen. Everyone remembered how Parks was well received that day when he arrived on the block. “I was only briefly aware of Parks, but because of the shoot, myself and so many others would go on to learn more about him,” said Styles. Lester also commented that once he was there, Parks then fully understood the historic importance of this project and why he was asked to take the photograph. Another important aspect that Tobak wants to convey is that the photos give homage to many unknown rappers. “The book gives insights into the history of hip-hop so no one just thinks that the music is just about who is the most famous,” said Tobak.